If you are an investor this is the property you have been waiting to come to the market. 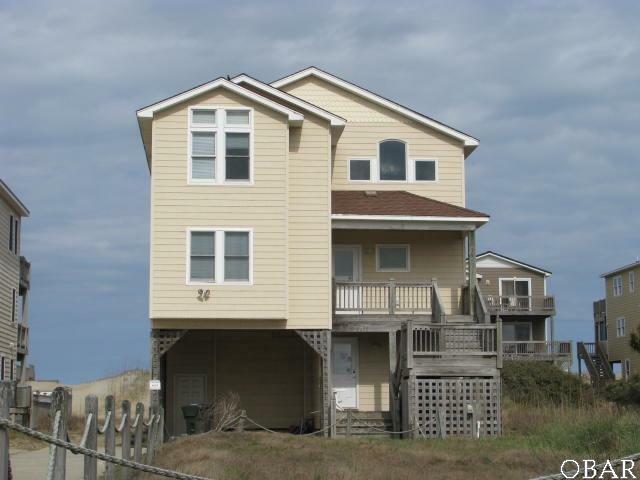 This is a 10 bedroom beach bargain that you will turn in to your "Rental Machine". The bedrooms are spacious. The lower level has a game room with a second refrigerator and diswasher, wet bar, laundry room and bedrooms. Mid level is bedrooms. The top floor is the main living area and includes a master bedroom, master bath and an open concept living area. There is a dining area large enough to support all your guest dining together. When you or your guests are finished enjoying the interior of the home the exterior will be calling to everyone. Relax on multiple levels of deck, lounge around the pool or take a dip any time of day. Enjoy the hot tub and the ocean breezes. This home has a private walkway to the beach and wonderful ocean views. Call today to view this property. The sale of the property is made on an "AS IS", Where is" and with All Faults" basis, and seller makes no warranty or representation, express or implied, or arising by operation of law, including, but not limited to, any warranty of condition, title, habitability, merchantability or fitness for a particular purpose with respect to the property or any portion thereof. Broker is prohibited by Seller from making any other contrary representation to anyone without express prior written consent of seller.